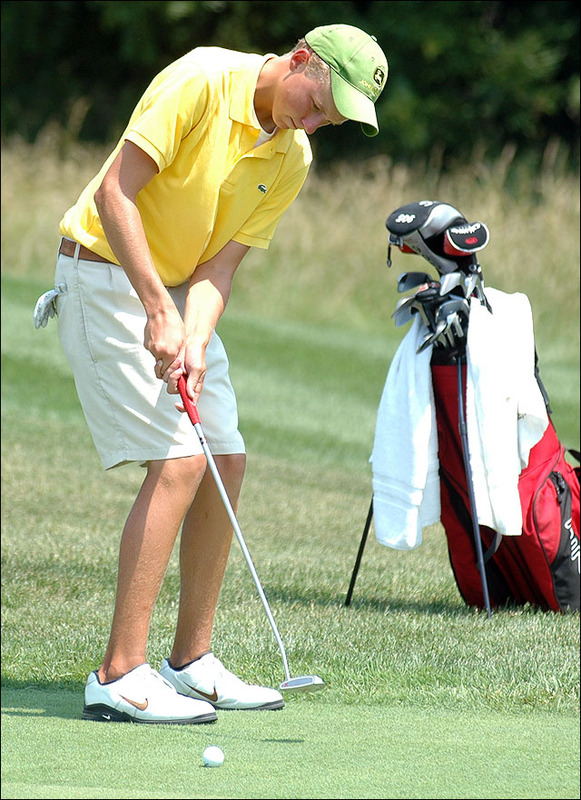 Kyle Smell might win the Kansas Golf Assn. Junior Amateur Championship – but not this year. Defending champion Dodge Kemmer hits a drive during the final round of the Kansas Golf Assn. Junior Amateur. Kemmer, of Wichita, beat Kyle Smell of Overland Park on the first playoff hole to win his second straight KGA title Thursday at Eagle Bend Golf Course. On Thursday, Dodge Kemmer showed why he won the tournament in 2004, beating Smell in a playoff after the final round at Eagle Bend Golf Course. Smell’s driver was his undoing. He sent two drives into the woods on hole No. 10 during the playoff and made triple bogey. 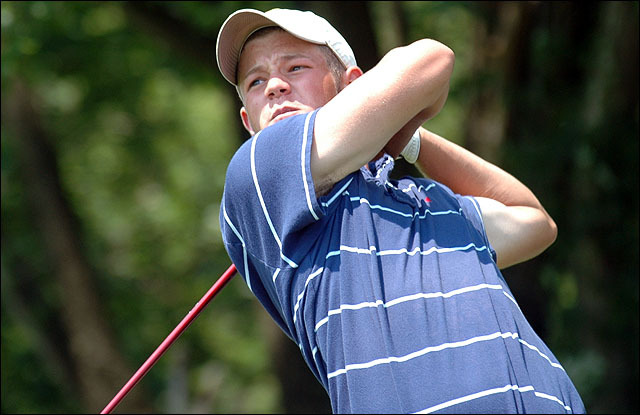 Kemmer made par, becoming only the fourth golfer in the tournament’s 46-year history to win consecutive championships. Former KU golfer Chris Thompson won in 1993 and ’94. Still, Kemmer wished for a different script. Despite the disappointing finish, Overland Park’s Smell found solace. For one, he’s only 16 years old, and he posted the best round all week with a 65 on Tuesday. Kemmer shot a 3-under 69 Thursday, tying Braeden Miller of Wichita for the day’s lowest round and scoring a 7-under 209 total. He would have won outright, but his group was docked a stroke because of slow play on the front nine. Overland Park's Kyle Smell putts on the No. 10 hole during the final round of the Kansas Golf Assn. Junior Amateur on Thursday at Eagle Bend Golf Course. Smell, who shot a final-round 70, was 6-under going into the 18th hole and needed a birdie to force the playoff. His third shot landed within three feet of the cup, and he sunk the putt. Kemmer sat atop the practice greens, realizing a playoff awaited. Kemmer, a Stanford signee, had a highlight on No. 18, too. After driving the ball next to the cart path and under a tree, he calmly put his second shot on the green. Brett Iliff led heading into Thursday after a two-day total of 137, and he was in the chase until a triple bogey on the par-5 16th. Brad Boan of Overland Park finished third in 211, followed by Iliff (212). 2003’s champion, Jason Schulte of Kansas City, Mo., shot 213. Michael McDonnell of Leawood (215) and Tyler Trout of Leawood (215) were the only other golfers under par for the tournament.